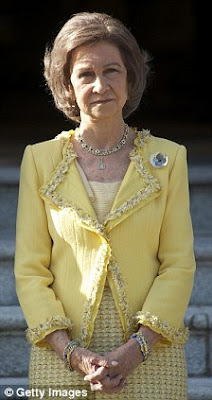 Amidst the rising cheer and excitement with the upcoming diamond jubilee celebrations, Spain’s Queen Sofia snubbed the invitation to join the queen and other heads of state for lunch at Windsor Castle. A spokesman for Spain’s Royal Family told that Queen Sofia’s presence is deemed “inappropriate in current circumstances.” The cancellation was not a personal matter, but rather engineered by the Spanish government, as a protest to Prince Edward’s upcoming visit to Gibraltar, a British possession that sits on southern the tip of Spain. The lunch for sovereign monarchs will be the largest gathering of crowned heads since the death of Queen Elizabeth the Queen Mother in 2002.